If your child’s picking eating is a source of meal time stress for you and your family, rest assured, you are not alone! Picking eating is a common area of concern for many of our parents. This could include refusal to try new foods, avoiding sitting at the dinner table, not eating appropriate quantities, and eating a restricted variety of foods. How does a child’s posture impact eating? This is our muscles ability to activate and maintain a controlled upright posture. For some children, not having appropriate postural stability when eating can have a huge impact at meal times. Instead of focusing on the task of eating, the motor area of the brain is working on remaining upright. Reduced postural control can also affect the fine motor and upper-limb coordination skills required to use a knife and fork, making the task of eating effortful. Dining room tables and chairs are too big for most children, reducing their postural stability. 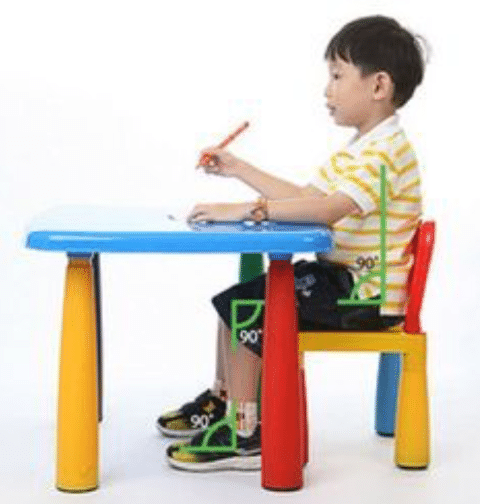 Provide your child with seating that supports 90 degree angles at the hips, knees and feet with adequate back support (see image). A non-slip mat placed on the seat of the child’s chair or highchair can allow them to feel more stable in the seat. Rubber non-slip placements can be found at supermarkets and are a convenient and affordable option. An occupational therapist can provide assessment of postural control and provide individualised strategies to support your child. Does your child have difficulty with oral motor skills? Some children may avoid foods that they find difficult to eat due to their chewing and swallowing skills. For example, if a child has reduced muscle tone in their mouth, they may avoid chewy foods as their mouths are likely to fatigue quickly. These children may also use their fingers to move food to the sides of their mouth, or have difficulty closing their mouth while eating. While eating, demonstrate to your child how you move the food to your back teeth with your tongue and exaggerate the jaw movements you use to chew your food. Present food in manageable bite sized portions based on your child’s skill level. If you suspect your child may have difficulties with their oral motor skills, it is best to contact a Speech Pathologist for further intervention and assessment. How does our sensory system influence our responses to food? Our sensory system includes tactile (touch), balance (vestibular), body awareness (proprioception), auditory (sound), oral (taste), olfactory (smell) and visual inputs. All of these senses impact a child’s ability to process and respond to different sensory input at meal times. Difficulties with sensory input can contribute to a child’s avoidance of particular foods, smells, textures and tastes. A desensitisation approach, encourages a child to be exposed to different foods while support their sensory processing differences. Involve your child in the preparation of the meal e.g. setting the table, washing the vegetables, washing plastic vegetables next to you, getting food out of the fridge, watching you cook while talking about the foods. Increase your child’s exposure to non-preferred foods by providing shared meals where plates of food are passed around to serve yourself. Do not pressure your child to take non-preferred foods, the focus is on exposing them to different foods in a non-threatening way. Encourage play with preferred and non-preferred foods at the table. This may include putting food in a garlic crusher, mixing foods, balancing food on yourself or on other foods. Discuss the sensory properties of the food e.g. talk about the food colour, texture, shape, size, temperature and taste. How do routines support eating and picky eaters? Children love routine. The predictability of a routine reduces stress, which is particularly important when tackling a challenging task. Routines also allow children to understand the expectations around meal times. Use the same place for each meal time with designated cues for eating. Cues for eating may include clearing the table, putting plain white placemats at the table before meal times and using the same coloured/types of plates for all member of the family. Middle: Serve shared, self serve meals, focusing on the food properties and modeling chewing/eating behaviours. End: Clean up and have your child put the food they have not eaten into the bin or a container (including non preferred foods which are not on their plate). This may be with or without touching the food (e.g. using a napkin to scrape the food into the bin). Children are most likely to touch or interact with non-preferred foods when they are putting them in the bin. Do not reprimand your child during feeding time as adrenalin suppresses appetite. Sweet foods can also be appetite suppressants so ensure sweet foods are not eaten first or before meals. Provide your child with consistent and explicit verbal praise for small steps toward tolerating different foods (e.g. “wow, I just showed you some chicken and you didn’t make a face!”). Limit the amount of distractions during feeding times. If a child is distracted while eating (e.g. watching television) their brain pathways shift and the child may eventually have difficulties eating without distractions. Picky eating can be caused by many factors, and you may need some additional support to identify the main area’s contributing to your child’s challenges and help you put the pieces of the puzzle together. If your child is experiencing difficulties with eating, and you’re unsure if occupational therapy can help, contact with the team at Empowered Kids and we will be happy to have a chat with you. The Challenges of Easter! Have you filled a bucket today?